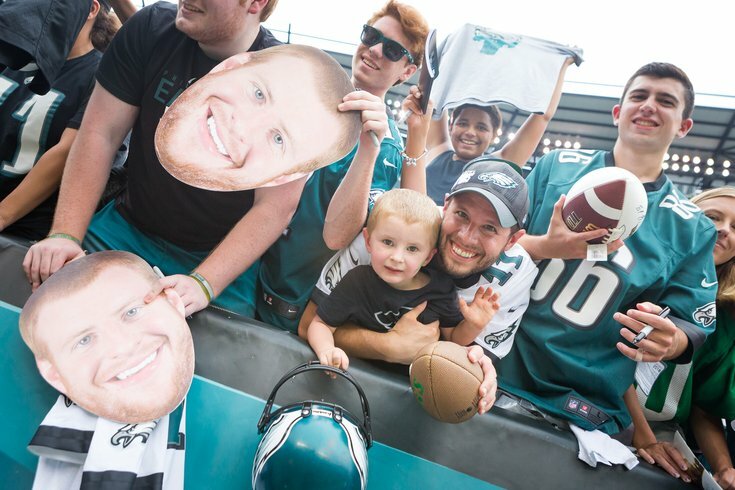 As the Philadelphia Eagles head into their final preseason game Thursday night against the New York Jets at the Linc, fans of the team are facing an unusual dilemma – there isn’t much to worry about or fear concerning upcoming season. All right, there are the constant questions about when quarterback Carson Wentz will be ready. But, even if he isn’t, using Super Bowl MVP Nick Foles is a pretty gaudy fallback position. Instead of the typical dread, the fanbase has taken a cue from Green Bay quarterback Aaron Rodgers, and the operative word going into the 2018 season as defending Super Bowl champions is – RELAX. Don’t worry about a few shoddy showings in the preseason, all will be good when the real season starts against the Atlanta Falcons. The team will pick up right where it left off at home against the Falcons last season, especially when you consider most, if not all, of the injured veterans should be back on board when the great roar goes up in South Philadelphia about a week from now. Strange times these are, the Eagles limping through a preseason, the star quarterback still a question, and the fan base is as confident as any in all of pro sports. Yep, it’s nice to be kings! In the meantime, right across the street, there's a team that's struggled to capture the fans' imagination during the summer of 2018 — the Phillies. But there are more than just a few reasons casual fans are hesitant to buy in. For one, if the Phillies can’t count on Odubel Herrera to start big games late in the season, why should they count on him to be a big part of their future? This is a total swing away from a previous stance here, but Herrera has to have a huge upside to make up for his mistakes. There is now enough evidence to suggest there is not enough upside to outweigh the downside. In other words, enough is enough and the Phils need to plan on a future without his highlights and low lights. . .
As for the Flyers, they have flown under the radar through their entire offseason — but you can bet that James van Riemsdyk will be a bigger addition than many fans consider. The fact he was here before makes it a less-than-splashy addition, but his scoring will be a huge boost, and the club’s power play should be one of the NHL’s best. Having considered all of that, the biggest burst of excitement in the upcoming preseason will come if young goalie Carter Hart is so good he has to stick with the team for the regular season. And finally, we're headed to Labor Day and it appears that the Philadelphia 76ers are not going to have a general manager in place, nor does it appear the organization is too concerned. It might be convenient to think that the situation is stable enough that coach Brett Brown can handle both jobs, but that would be a mistake. The Sixers really need to have a better support system in place, and it is unfair to Brown to give him another job to handle. Over the past few seasons, Brown has been marched out to be the team’s spokesman time and again, and it’s well past the time that he is simply charged with coaching the team and nothing else. Rarely is any season smooth sailing from start to finish, and Brown should have his hands full just trying to match what the club did last season, let alone take a step forward. In the meantime, this is the Eagles' world, and we're all just living in it. • For those who want athletes to “stick to sports," consider that Houston’s JJ Watt sponsored a funding campaign to raise over $41 million to help victims of the recent Hurricane Harvey aftermath. The running total on Watt’s crowdsourcing campaign is $41.6 million. • Count this in the we-got-it wrong column – the Phillies probably should have made a deal for Cole Hamels at the trade deadline. Since coming back to the National League Hamels has been a gem for the Chicago Cubs. Unfortunately, he won't be facing his former team when the Cubs roll into town. • If you want to know how out-of-balance some college football programs have become, consider the mess at Ohio State where coach Urban Meyer is facing a light three-game suspension for his lack of action in the domestic abuse allegation concerning former coach Zach Smith and Smith's former wife Courtney. And that’s the problem: Winning should not erase such bad behavior. • Of all places to put a halt to expressive outfits – the French Open? Seems the French had a problem with Williams’ tight cat suit that was inspired by the Black Panther movie. No worries: Williams showed up at the US Open in a tutu of sorts, and all that really matters is that whatever she wears, she is a force on the tennis court. Can’t imagine what she would wear if she reaches the finals.